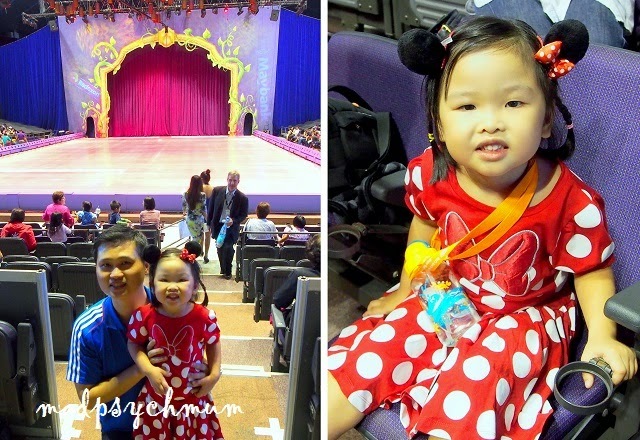 We caught Disney On Ice Treasure Trove when it premiered at the Singapore Indoor Stadium last Wednesday! Between me and the girl, guess who was more excited? While many of the girls were decked out in Disney Princess outfits, my girl went as.. wait for it.. Waving to the real Minnie Mouse! The show started promptly at 7.30pm with Toy Story, Alice in the Wonderland and Peter Pan. To be honest, we were really bored. At one point I was singing A Whole New World in my head and tip-tapping my foot in anticipation of the Disney Princesses while Peter Pan was busy saving Wendy from Captain Hook. Don't get me wrong, I love Woody and watched Peter Pan and Alice in the Wonderland many times but c'mon, 2 scenes per movie is good enough (where are the princesses?)! Thankfully it got more interesting after the intermission as Rafiki started howling to the Circle of Life at the top of Pride Rock. This was my mum's favourite part of the show as The Lion King is her favourite Disney movie of all time (it was also the only movie she took us to watch at the cinema as kids! Can you believe it?!). One of my favourite characters.. no not Aladdin.. the Genie!! There were some nice Magic Carpet flying action to A Whole New World, but I'll leave you to see it for yourself. My girl was mouthing the song with her eyes fixed on Princess Jasmine the whole time so it is safe to say, we were mesmerised! After that, we were brought underwater as Sabastian sings about how it is much better Under the Sea than "anything they've got up there"! Beautiful glow sticks and special lighting brought out the mystery of the underwater world! After Rapunzel (of Tangled) and Princess Tiana (of Princess and the Frog) took the ice in a beautiful dance with their princes, the rest of the princesses and their partners did a final dance in the finale. If you have yet to catch it, there are still 6 shows to go! Purchase your tickets at Sports Hub Tickets Box Office, at any Sports Hub ticket outlet at all SingPost locations, online at this website or call their hotline at +65 6333 5000.